This extraordinary bouquet shows your delicate feelings and devotion to the idea of romance. 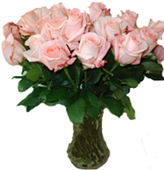 23 white and pink roses with gypsophillas make the arrangements airy and tender. 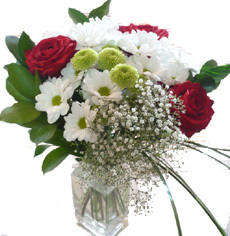 Contains: 20 short-stem roses, 7 gerberas, 1 ghypsophillas, greenery in the ceramic vase and natural wrapping. 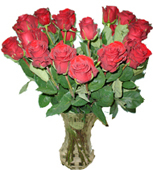 If the roses are replaced with the holland long-stem roses, the number of roses is reduced. The well-shaped lilies and roses arrangement in a vase make any festive occasion - unforgettable. 7 red roses, 7 white lilies, 5 ghypsophillas with greenery. A wonderful gift for your beloved, sweetheart, mother or true friend. 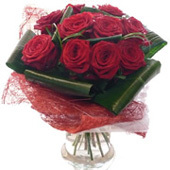 The heart shaped read roses will express the deepest feeling of love, romance, devotion and gratitude. 35 red roses, 4 white gypsophillas, greenery on a fine coaster. 25 red roses, with ghypsophillas, greenery on the floral work arranged with bergras, pearls, decorative elements and a ribbon of natural fabric. An outstanding large gift basket with 2 bottles or champagne and 2 boxes of chocolates Ferrero Roche. 7 bright roses, 3 large chrysanthemum with statitsa, draceana and greenery will be a great present for beloved or for the colleagues. When the recipient will take off champagne and chocolates the basket will preserve the same beautiful shape and style. The exclusive flowers mix in the basket is very festive and will become the unique present for the special occasion. Contains: decorative pine-apple (flower), 5 chrysanthemum, 2 ornitogallum, 5 eucalipt, 10 fresias, 7 red roses, 2 anthuriums, 2 fatsia, 2 ghypsophillas, 11 yellow roses, greenery, butterflies, ribbons. 31 (in large arrangement) white, peach and red roses with ruskus and other greenery in natural wrapping in a glass vase.